[Talking to Jewish leaders who opposed him, Jesus said,] "Yet it isn't I who will accuse you before the Father. Moses will accuse you! Yes, Moses, in whom you put your hopes. If you really believed Moses, you would believe me, because he wrote about me. But since you don't believe what he wrote, how will you believe what I say?" Jesus is that great prophet like Moses that God had promised would come. However, Jesus is greater than Moses. The covenant that Jesus brought is greater than the covenant given through Moses. At the same time, Jesus fulfills the law of Moses. Jesus teaches the heart of God that lies underneath the law of Moses. So, we look to the law as the way to bring us to a deeper appreciation of God's grace given us in Jesus (Galatians 3:26-29; Galatians 4:1-4). 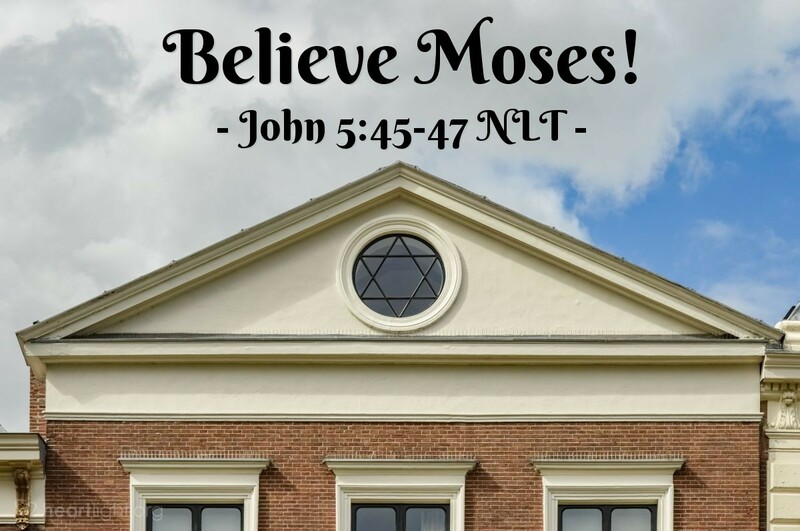 We can appreciate and admire Moses, but we set our faith and our hopes on Jesus, God's Son! Father, thank you for the Old Testament, especially the Torah,* which reveals your holiness, power, mercy, deliverance, and care. Thank you that your old covenant looked toward the coming of a new covenant when your will and words would be written on people's hearts. May I live that holy character that your law reveals, yet may I live out of appreciation for your overwhelming grace in Jesus, in whose name I pray. Amen. *The Torah consists of the first five books of the Old Testament (Genesis — Deuteronomy). The Torah is sometimes also referred to as the law or the Pentateuch.